The day after the Netherfield Ball Mr. Bennet goes on a horse ride and has an accident that leaves in some kind of come for a while. The doctor, fearing for the Bennet girls safety, asks Mr. Bingley to assist them and while he and Darcy visit the family, the most unexpected event occurs. In front of all the guests, Mr. Collins announces he wants to marry Elizabeth. 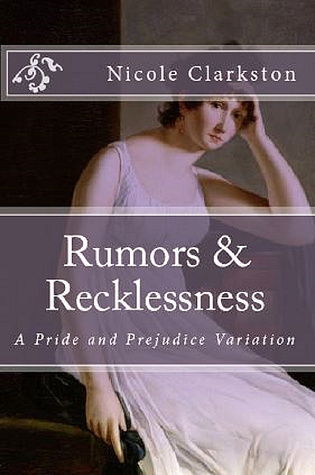 She is obviously forced to refuse him in front of everybody, but when no one comes to her aid because her father is still unconscious and her mother is thrilled with these news, Mr. Darcy declares she cannot accept Collins because she is already engaged to him. I absolutely loved this premise and when I started reading this book I could not put it down due to the fluidity and quality of the writing. I believe that amongst all the JAFF books I’ve read this is the one that best reflects Darcy’s struggles regarding Elizabeth’s position in society and her relations. It was perfect, and very Darcy like, I loved reading about everything he was thinking. As Elizabeth gets engaged against her will earlier in the story, we see her get angry at Darcy and at his presumption that she needed rescue but we also see her getting to know him better and falling in love with him. Also Wickham cannot influence Elizabeth in this book and that was refreshing, but he does influence Lydia and distorts the Colonel’s character which was an innovative twist. Mr. Bingley was very astute a proactive in this book and I liked that, it was interesting to see more of him. I often see him portrayed as a silly man who can only smile, and this Bingley actually contributed to conversations and to the story, he is more than a one dimension character and that was interesting to see. After an incredibly good beginning it seemed the second half of the book did not hold the same energy and that small detail was my only quibble with it. Everyone’s thoughts are explained to detail and I would prefer a more speedy outcome. Overall I really liked this book, the characterization of Elizabeth and Darcy in the beginning of the book is very good, it also has some nice flirtatious moments between the engaged couple that are appealing but not overly intense or improper and the writing is very good. I highly recommend it to romance lovers. Loved reading your thoughts on this fantastic story! I read it some time ago,waxed lyrical about it in my GR review and awarded it 5 glowing stars! This was one that I planned on reading just one chapter before bed and ended up going for nearly half the book. Love this review and I agree completely. It was 5-stars for me. Thanks for the review. I also enjoyed this book although it was 3 years ago that I read it. Sounds like a good read. I’ll add it to the TBR pile. Thanks for a great review, Rita! Lovely review! I so enjoyed this story too!